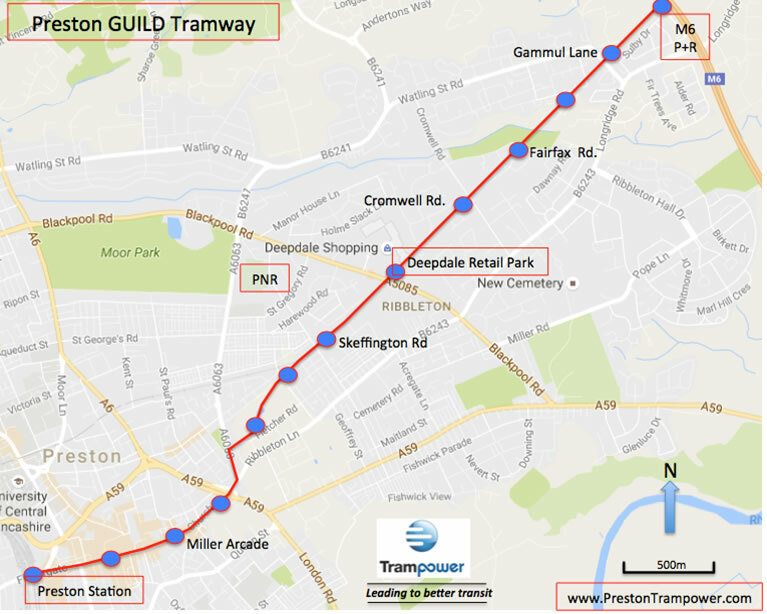 The Preston GUILD Tram Line is part of the Preston City Local Plan 2012 – 2026. This calls for a less polluting and sustainable public transport system to attract trips from cars, reducing congestion and pollution. This is critical as over 100 people a year are killed in Preston by traffic toxic fumes, especially near congested roads. While about 5 people a year are killed in road traffic crashes. The World Health Organisation (WHO) has defined diesel engine emissions as carcinogenic. These also retard the development of children’s brains and be a cause of dementia in old people, as well as many cardio-vascular diseases. There is no foreseeable economic benign alternative to replace diesel and petrol engines on the market. Even if emission free engines were available, over half of the microscopic particles come from tyre, tarmac and brake dust and would still exceed safe levels in air. Trams operate without pollution, and using renewable power reduce greenhouse gases and global warming. Like many cities, Preston is faced with increasing congestion and parking problems in and around the city centre. The growing student numbers and new city centre developments in the retail, business and residential sectors means that these problems will become even worse. The GUILD tramway will ease these problems by enhancing the use of the Park & Ride sites surrounding the city and reducing the number of journeys made by car. The existing network of disused and underused railways in Preston could provide for some new tramways. In many areas much of the infrastructure is largely in place, minimising disruption and construction work required introduce new lines. The GUILD Line is the first proposed. It will connect the City Centre through the Deepdale and Brookfield areas to Red Scar Industrial Estate and a Park & Ride stop. Preston is a noisy city. Traffic has replaced the noise of factories. Individually motor vehicles are quieter but the increase in traffic volume means that noise is about the same or worse. Traffic noise is linked to high blood pressure and other signs of health stress. The WHO sets 55dBA as a safe daytime street noise level. Most busy streets are over 65dBA, twice as loud. Buses and lorries are about 70dBA. The City Class tram to run the GUILD Line has a passing noise level of 55dBA. Many people will not be able to hear trams over the noise of other traffic. Crossing the road is another challenge when there is a lot of motor traffic. Busy roads create barriers between communities. Trams are proven to attract car trips. An average of 25% of tram passengers in Britain have left a car at home. A household survey of Brookfield and Deepdale, show that 80% of residents support the tram plan, and 80% said they would use the tram at least twice a week. The GUILD Tram will take about 15minutes between Brookfield and Fishergate, faster than driving. Less traffic, makes roads nicer for meeting people, safer to cross and healthier to live near. This Preston Trampower project is financed through private funds, without public grants or subsidies. Tram Power has developed a proven, low-cost approach which can reduce carbon emissions by 75% and cut capital and operating costs by half. Preston Vision is supportive of any proposals which have sustainable integrated transport solutions at their heart. There is clearly potential to better link the people of Preston to their current place of work or potential employment opportunities through provision of appropriate transport connections and in so doing, reduce the level of carbon emissions through reduced car and other vehicle usage. In addition to the functional and environmental benefits, there will be economic benefits in terms of jobs created through the operation of the transport system and in the manufacture of the vehicles. The installation of a tram system in a city like Preston will also be hugely positive in terms of the city’s image and profile”. Having received information regarding the Preston and future Central Lancashire Tram Network, coupled with being a proud Prestonian, I would like to express support for the project both personally and on behalf of Enterprise. The Preston tramway being planned by the Trampower team is one of the most innovative projects to date. This project will relieve congestion, improve air quality, and regenerate along the corridor and the city of Preston itself. …this is an important project, as it delivers many environmental and congestion benefits at virtually no cost to local authorities.